Mr. Garcia joined the Firm in 2010 as a Partner focusing on the areas of corporate and business law, regulatory compliance, public utility, energy, commercial transactions, insurance defense, and public/government entity representation. Mr. Garcia has over 25 years of experience representing and advising corporate and governmental agency clients in a wide variety of administrative and judicial proceedings and litigation, including corporate law and commercial transactions involving both private businesses and public entities; state court litigation and administrative proceedings before state commissions and boards; wholesale energy proceedings before the Federal Energy Regulatory Commission (FERC); civil rights claims before the Equal Employment Opportunity Commission; environmental compliance matters before state and federal environmental agencies; as well as employee labor matters before state labor commissions/boards. His experience includes numerous regulatory enforcement proceedings before state and federal regulatory agencies; defending clients in regulatory compliance and financial audits; representation of clients in commercial contract negotiations and daily business/government operations; as well as representation of small business clients in a variety of corporate and commercial matters. Prior to joining the Firm, Mr. Garcia was Of Counsel to Miller Stratvert, P.A., representing business and utility clients in litigation and regulatory proceedings before the New Mexico Public Regulation Commission (NMPRC); and he also developed legal strategies and advised clients in federal regulatory matters before FERC. Mr. Garcia represented business clients in various commercial transactions and contract negotiations; merger and acquisition transactions; real estate and land transactions; and advised clients regarding compliance with state and federal regulatory requirements, including defending utility clients in operational audits completed by federal regulators related to national electric reliability standards. Prior to joining Miller Stratvert, Mr. Garcia was in-house counsel for PNM Resources, Inc., for 15 years. As in-house corporate counsel, Mr. Garcia had wide ranging experience advising and representing various subsidiaries under holding company structure and utility divisions in corporate and commercial contract matters in both retail and wholesale business operations. He represented the utility divisions in litigation, complex contract negotiations, administrative retail utility proceedings before the NMPRC, wholesale energy regulatory proceedings before the FERC and the Department of Energy, administrative proceedings before state and federal environmental agencies, and in regulatory compliance and enforcement proceedings. Mr. Garcia represented the Company’s electric distribution, transmission and energy marketing and natural gas utility businesses to meet business objectives and compliance requirements, and negotiated contracts for energy transactions in the wholesale and international energy marketplace under dual federal/state regulatory framework. He advised clients on the interpretation and application of both federal and state regulations, including Securities and Exchange Commission corporate compliance; electric and natural gas utility tariffs; he participated in state and federal rulemaking proceedings; and developed and implemented an on-line training program for employee compliance with federal regulations and business practices for energy marketing activities. Mr. Garcia was lead counsel defending utility operations in FERC operational and compliance audit; lead in-house counsel on PNM/Western Resources merger transaction, in the development of regulatory strategies and filings, and in obtaining regulatory approvals for the reverse merger transaction from multiple state and federal jurisdictions. Mr. Garcia managed multiple energy trading litigation claims simultaneously pending in several Western states and federal administrative agencies resulting from the California energy crisis, which included defending multiple interlinking claims pending in both state and federal courts and federal administrative agencies, while pursuing administrative agency relief and engaging with state and federal regulators and stakeholders to develop potential market-wide industry solutions. During his time at PNMR, Mr. Garcia also represented a variety of start-up competitive energy services businesses in multiple states during period when the electric utility industry was undergoing fundamental structural and regulatory changes. He conducted extensive commercial contract negotiations, both domestic and international, in a variety of commercial transactions for partnership, joint development, ownership and operation of energy projects and services; including the development, ownership and licensing of intellectual property. These competitive businesses developed in conjunction with formation and launching of corporate subsidiaries that provided competitive energy services. Mr. Garcia has experience in Arizona, Nevada and California regulatory and legislative proceedings where he worked to establish the framework for new competitive markets for energy services and to obtain all necessary approvals and permits to conduct competitive energy services businesses. He engaged regulatory advisors and lobbyists in development and launching of energy services and projects in both United States and Mexico. Mr. Garcia also served as Corporate Secretary for energy services subsidiary. Additionally, Mr. Garcia served as Environmental Counsel for PNMR , representing electric, natural gas and water utility divisions in their operations to achieve environmental compliance. He has had extensive interaction with state and federal environmental regulators and stakeholders regarding the compliance of multiple utility division operations. Mr. Garcia has advised the utility on a groundwater contamination remediation project; negotiated terms for soil contamination remediation associated with oil and gas production in asset sale transaction; negotiated a settlement with Environmental Protection Agency in Superfund action site in Colorado; and advised PNMR in the development and implementation of corporate environmental compliance program. Mr. Garcia started at PNMR as Operations Counsel, Gas Services, where he represented natural gas utility division operations, including extensive regulatory proceedings before the NMPRC for natural gas utility safety and rate operations; he reviewed and drafted legislation and rulemakings for natural gas safety regulations; engaged in extensive contract negotiations for natural gas sales and transportation services. Prior to joining PNMR, Mr. Garcia was Chief Attorney at the U.S. Department of Housing and Urban Development, where he gained multi-faceted experience in administrative law, real estate transactions and litigation. His experience at HUD included compliance and enforcement of federal programs for single and multifamily housing development under federal programs and initiatives. As a Special Assistant U.S. Attorney, Mr. Garcia represented the agency in administrative enforcement, foreclosure and bankruptcy proceedings in state and federal courts. Upon graduation from law school, Mr. Garcia was Assistant General Counsel at the Kansas Corporation Commission, where he gained extensive experience in all aspects of administrative law and litigation in the regulation of public utilities, oil and gas production and motor carriers. He managed and prosecuted electric, natural gas, water utility, railroad and motor carrier cases; advised and made recommendations to five member Commission on deliberations and decisions on pending adjudicatory cases. Mr. Garcia was lead counsel for the Commission in electric and natural gas administrative proceedings before the FERC; and also lead counsel for the Commission in both the trial hearing and Commission deliberations in merger transaction involving the two largest electric utilities in Kansas. The Commission’s order from this case, which can be found at 127 PUR 4th 201 (Kan. S.C.C. 1991), is still a leading case in the industry setting the standards for evaluating the mergers and acquisitions of utilities. Mr. Garcia was the recipient of 1988 Walter Hiersteiner Outstanding Service Award presented by the K.U. law school faculty to the graduating student whose service to fellow students in the university community demonstrates the greatest promise for contribution to the legal profession and to society. Mr. Garcia is a member of the State Bars of New Mexico and Kansas. He is admitted to practice before the United States Courts of Appeals for the Tenth Circuit and D.C. Circuit; the United States District Courts of New Mexico and Kansas. 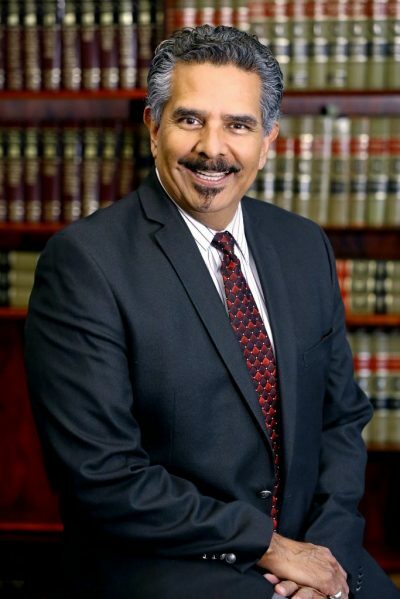 Mr. Garcia is a member of the American Bar, Albuquerque Bar, Hispanic National Bar Association (HNBA) and the New Mexico Hispanic Bar Association (NMHBA). He served as the Convention Chair for the 34th Annual HNBA Convention and First Judicial Summit, held in Albuquerque in September 2009. Mr. Garcia also served on the Board of Directors for both the HNBA and the NMHBA. Mr. Garcia is also a graduate of the Greater Albuquerque Chamber of Commerce Leadership Albuquerque program from 2007. He previously served on the Board of the Rio Grande Educational Collaborative, Inc., a non-profit organization that developed and implemented programs to keep at risk middle and high school students in school.